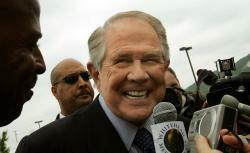 Pat Robertson blames atheists for the Wisconsin Sikh shooting. Is that good for Muslim-Christian peace? Pat Robertson’s slam of atheists for the Wisconsin massacre was actually a step toward religious brotherhood. Pat Robertson is using Sunday’s mass shooting at a Wisconsin Sikh temple to pick a religious fight. That’s the story going around the lefty blogosphere, based on a 40-second clip of Robertson apparently blaming the massacre on atheists. But the full context of the clip paints a more encouraging picture. It’s a picture of Christian fundamentalists learning, in their clumsy way, to identify with other faiths. This notion of Christianity and Islam as incompatible faiths locked in a divinely ordained war drives much of the world’s bloodshed. In this country, it has inspired proposals by Michele Bachmann, Newt Gingrich, Herman Cain, and other conservatives to investigate Muslims in the U.S. government. What happened in Wisconsin—the nihilistic murder of peaceful, non-Christian believers at their house of worship—has rattled this sectarian mindset. It has invited Christians to see, in Sikhs and Muslims, their own brothers and sisters. This is only the latest in a long string of assaults on worship services. Back in 2007, shootings in Colorado rocked two church communities. Four people were killed after a gunman opened fire at a missionary school and at a church in Colorado Springs. More recently, in 2010, three hooded men walked into a church in Richmond, California, opened fire, then fled the scene. And in Maryville, Illinois, back in 2009, a shooter walked into the First Baptist Church and shot the pastor point-blank. Now the Wisconsin Sikh temple joins the list of senseless killings. What is it? Is it satanic? Is it some spiritual thing—people who are atheist, they hate God, they hate the expression of God? And they are angry with the world, angry with themselves, angry with society, and they take it out on innocent people who are worshiping God. And whether it’s a Sikh temple or a Baptist church or a Catholic church or a Muslim mosque, whatever it is, I just abhor this kind of violence. And it’s the kind of thing that we should do something about. But what do you do? What do you do? Well, you talk about the love of God and hope that it has some impact. Right Wing Watch and other critics—Wonkette, Crooks & Liars, Truth Wins Out, the Huffington Post, and many others—portray Robertson’s speculation about atheists as ignorant and reckless. They’re right. No evidence to date shows that the Wisconsin shooter, Wade Page, was an atheist or that atheism motivated him. But the full context of the 700 Club segment does indicate that Robertson’s remark was part of a psychological pivot. He was thinking less about atheism than about defending other faiths. At the outset, Robertson described the temple as a “house of worship.” In the ensuing script, Meeuwsen and Graham methodically linked the attack to similar assaults on Christian houses of worship. The parting clip of the Sikh woman underscored the equation of temple with church. And in his conclusion, Robertson condemned violence against “innocent people who are worshiping God … whether it’s a Sikh temple or a Baptist church or a Catholic church or a Muslim mosque.” Against this background, the pot shot at atheists, phrased as a question, looks less like an accusation and more like a groping inference: Whoever committed this crime against “people who are worshiping God” must hate God. In defense of atheism, some of Robertson’s critics depict Page as a Christian. Noting that “white supremacy movements often encompass a form of Christianity” and that one of Page’s tattoos was a “commonly used [as] a symbol of the Christian Holy Trinity,” they argue that he “most likely identified himself as a Christian.” But calling Page a Christian, without better evidence, is no more justified than calling him an atheist. (From his lyrics and interviews, it seems pretty clear that he was just a nihilistic racist.) And it’s more harmful, because it feeds the narrative of religious war. One of the saddest spectacles in the aftermath of the Wisconsin shootings has been Sikhs pleading that they aren’t Muslims. It’s an understandable plea, after years of violence against Sikhs by Americans who confused them with Muslims. Given what we know about Page, he probably made the same error. But the bigger error was taking religious difference as a license for war. And that’s the error Robertson renounced. Some day, God willing, Robertson will learn the difference between atheism and nihilism. He might even learn to distinguish Islam from extremism. But his comments about the victims in Wisconsin, and about Sikhs and Muslims generally, are a step in the right direction. He was trying to say, in his primitive way, that Christians have more in common with the worshipers who died in that temple than with the hard-hearted white man who shot them. And you know what? He’s right.